Celebrate Rakshabandhan by delivering this Chocolate Hampers of 16 pcs Ferrero Rocher Chocolates, Cadbury Celebration , Nutties, Chocopie Chocolate with 1 Rakhi and Free Roli Tilak and Chawal. 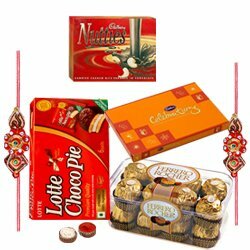 Chocolate Hampers of - 16 pcs Ferrero Rocher Chocolates, Cadbury Celebration, Nutties, Chocopie Chocolate with 1 Rakhi and Free Roli Tilak and Chawal. Chocolate Hampers of - 16 pcs Ferrero Rocher Chocolates, Cadbury Celebration, Chocopie Chocolate with 2 Rakhi and Free Roli Tilak and Chawal. Chocolate Hampers of - 16 pcs Ferrero Rocher Chocolates, Cadbury Celebration, Chocopie Chocolate with 3 Rakhi and Free Roli Tilak and Chawal. Chocolate Hampers of - 16 pcs Ferrero Rocher Chocolates, Cadbury Celebration, Chocopie Chocolate with 4 Rakhi and Free Roli Tilak and Chawal. Chocolate Hampers of - 16 pcs Ferrero Rocher Chocolates, Cadbury Celebration, Chocopie Chocolate with 5 Rakhi and Free Roli Tilak and Chawal. Chocolate Hampers of - 16 pcs Ferrero Rocher Chocolates, Cadbury Celebration, Chocopie Chocolate with 6 Rakhi and Free Roli Tilak and Chawal.